Ces- a more creative product demo? 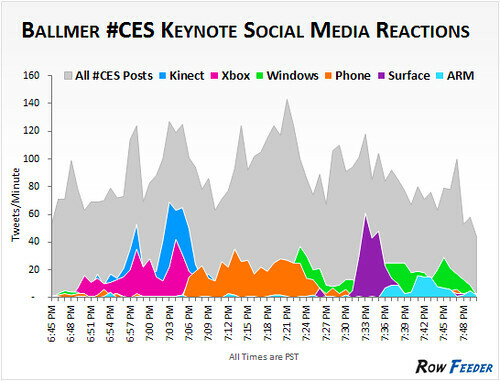 The chart above is an interesting analysis of Steve Ballmer’s keynote and shows which parts of his presentation got the most pick up in the Twitterverse. Everything is measurable, not just the audience for the keynote itself, but the impact of an individual sentence. In the future, you can imagine these keynotes getting benchmark scores and CEO’s getting incentive payments based on their ability to exceed their own scores and those of previous CEO’s. Consumer electronics has to be the most talked about category in the social media space with hundreds of column inches and dozens of blogs dedicated to the topic. The category is big news every single day, but when it gets to CES, this world kicks into over-drive. Simply so much is going on and unlike the past, where there were a limited number of media outlets covering the show, everything is getting covered. While it’s clear that this used to very much a trade show, the aperture has opened up considerably and every gadget lover in the world is tuning in via their favorite media outlet to see what products are getting buzz. One thing that’s very interesting is that despite all the showbiz, the collective force of media seems to be only focused on one thing, the product. The only content that the media want and the audience wants to see is the demo. As you look through the blogs and the YouTube channels, it’s pretty much all you see- grainy hand-held footage of bloggers interviewing product managers who are showing their products. It’s enough to give people a feel for what the product is about, but it’s very rudimentary. It seems more thought could be given to demos to make them more appealing and perhaps differentiated. They could be customized according to the interviewer, or based on specific scenarios or user cases. They could be filmed in the real world with real people, or perhaps even with relevant celebrities. While it’s understandable that there’s a desire to remove all the artifice away from the product and get to the purity of what it really does, there’s got to be something more creative that could be done with the product demo.